Drive Forms (ドライヴフォーム, Doraivu Fōmu?) are special forms that appear in Kingdom Hearts II. Through the magic of the clothes that Flora, Fauna, and Merryweather gave him at the Mysterious Tower, Sora is able to temporarily take on a new appearance that grants him a separate set of abilities, often through merging with his allies. Use of Drive Forms is regulated by the Drive Gauge. Sora's use of Drive Forms is mechanically similar to Riku's Dark Mode and Link Styles, or Terra, Ventus, and Aqua's Command Styles. Entering a Drive Form immediately refills Sora's HP and MP Gauges, but more visibly, it gives his outfit a style bearing the color and symbols of that Form, while replacing his normal Action and Growth abilities with a new list of Action, Growth, and Support abilities, while retaining his equipped Support abilities. These changes can go so far as to grant dual Keyblade wielding or variations of Sora's Magic spells. Excluding AntiForm, each Form can gain unique experience through a specific method while the Form is active. The maximum level for each Form starts at 3 when Valor Form is obtained, then rises by 1 with each new Form unlocked until Final Form, where the maximum is raised to 7 across the board. In addition, every Form has an associated Growth ability that grows as the form does, and, with the exception of AntiForm, upgrading the Form's Growth ability allows Sora to use that ability in his Standard Form, albeit at a lower level. If Sora is in any Drive Form besides AntiForm when a cutscene begins, he will appear in the cutscene in that Drive Form. The cutscene will be otherwise unchanged, and Sora will handle his main-handed Keyblade as he normally would, regardless of whether the form grants dual-wielding or not. The only exception is if Sora completes the Battle of the 1000 Heartless in Limit Form in Kingdom Hearts II Final Mix, since in the original Kingdom Hearts II, Sora was incapable of using any Drive Forms at that point, and Limit Form is a Final Mix-exclusive. 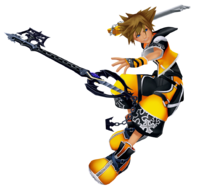 If Sora mounts a skateboard while in a Drive Form, he will not revert to his normal form even when the gauge is depleted. While the Drive Gauge is being depleted, Sora can return to any non-combat area, such as the World Map or a room where the party characters are present, to reset it to full. Alternatively, he can enter and exit the Underworld Cups that overwrite the Drive Gauge for the same effect. This is especially useful for leveling the Forms and Summons. In the room where Sora receives his new clothes, hints to future Drive Forms that he will receive later on can be found by examining the mirrors - each of the five mirrors around the room describes the abilities of one of Sora's original five Drive Forms, including his AntiForm. It should be noted that in Final Mix, an extra mirror is added for Limit Form. There are six Drive Forms in total. All but one can be triggered on command from the list of Forms within the Command Menu, while the last, AntiForm, is a penalty form that randomly activates if the basic Drive Forms are used in excess. Valor Form allows Sora to wield two Keyblades of the player's choosing at the same time. It specializes in physical combat, but can't cast spells, contrasting to Wisdom Form. Its growth ability is High Jump, which increases the height of Sora's jump. Sora wears red clothes with a red fleur-de-lis symbol. It uses Goofy's power and is based on him. Sora's running speed is noticeably enhanced in this form. This form gains experience with each successful hit on an enemy, making it the easiest form to level up. Sora gains this form when he obtains his new clothes from the fairies at Yen Sid's Tower. Wisdom Form lets Sora float across the ground like on a skateboard, and uses a single Keyblade to shoot enemies with magical bullets, but not physically strike. It is a Magic-based form, in contrast to Valor Form's physical combat. Its growth ability is Quick Run, which is a fast dashing technique to move quickly through areas or dodge attacks. Sora wears blue clothes with flame symbols on it. It uses Donald Duck's power and is based on him. This form gains experience whenever a Heartless is destroyed. It is obtained after Timeless River is completed. Limit Form, exclusive to Kingdom Hearts II Final Mix, lets Sora channel specific abilities from Kingdom Hearts. Its growth ability is Dodge Roll, a small leap forward that defends Sora from all attacks, and reflects projectiles. 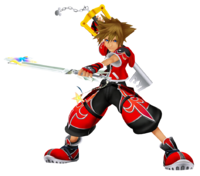 The color scheme of Sora's clothes in this form change to that of his original clothes from Kingdom Hearts to reflect this. When triggered, both partners stay by Sora's side and do not disappear, making it especially useful during tough battles. This form gains experience whenever a Limit Finisher Reaction Command is used. It is obtained when Sora receives Oathkeeper in Twilight Town. This is the only form that Sora can trigger alone. Master Form is a combination of both Valor and Wisdom forms. It uses two Keyblades, one controlled through telekinesis and the other with the hand. It specializes in both Magical and Physical Combat. Its growth ability is Aerial Dodge, a midair jump that blocks attacks (and reflects projectiles). Sora wears yellow clothes with a cross motif. It is based on King Mickey and uses both partners. This form gains experience via collecting Drive Orbs. Every small orb is worth 1 EXP while every big orb is worth 3 EXP. It is obtained in Hollow Bastion by speaking to King Mickey before the Battle of the 1000 Heartless and during the events of Space Paranoids. Final Form allows Sora to access his full power and wield two Keyblades through telekinesis. Its growth ability is Glide, which allows the user to fly briefly. Sora wears silver clothes with the symbol of a crown. It is based on Roxas's fighting style and uses both characters. This form gains experience whenever a Nobody is destroyed. It is obtained randomly after Sora fights Roxas in The World That Never Was, at which point it begins activating randomly when other Forms are chosen; however, after it has been activated once, it is added to the Form Menu and can be accessed at will. Unlike the other Forms, use of Final Form is not considered excessive, so not only is use of Final Form unable to activate AntiForm, it will actually reduce the likelihood of activating AntiForm overall. AntiForm, unlike the other forms, can only be activated randomly, and is essentially a penalty form triggered by overuse of the basic Drive Forms. It specializes in fast, bestial attacks using Sora's claws, but lacks the ability to cast spells, guard, recover HP, use the Keyblade, and use Reaction Commands. The likelihood of activating AntiForm is governed by Anti Points, a hidden counter that increases when any form aside from Anti or Final Form is used. 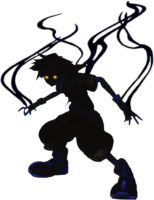 In this form, Sora takes on the appearance of a Pureblood Heartless, with yellow eyes, and a dark mist rising from its body. It uses both partners, consumes the entire Drive Gauge, and can only be exited if there are no enemies in the field or when the Form Gauge is depleted. This is the only form that cannot level up.